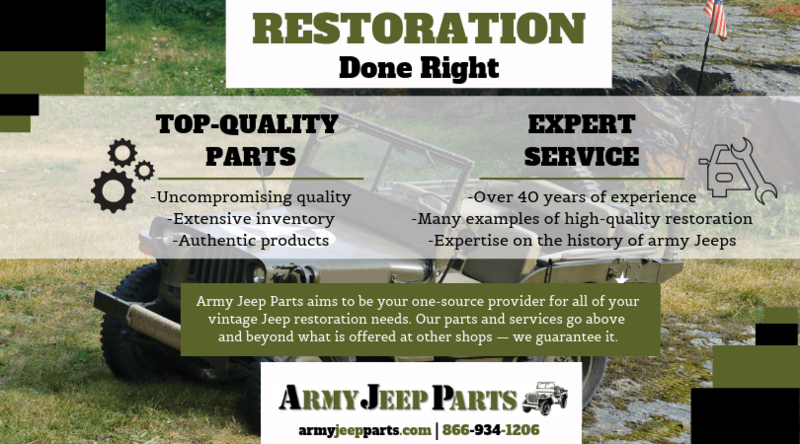 Throughout the years, we’ve met many vintage jeep enthusiasts that have worked with jeep restoration companies that deliver sub-par service and or products. When people carry out a restoration project with these companies they end up with a jeep that does not fulfill their intended goal of have a fun & reliable piece of history to enjoy in their free time. When you’re restoring your vintage military jeep, quality parts and the expertise of those who service your vehicle are vital to a successful restoration project. At Army Jeep Parts, we pride ourselves on our extensive knowledge regarding all things army jeep — whether that’s service, parts, or history, our staff is the best in the business — bar none. We’re one of the oldest suppliers for both parts and service in the areana of military vintage jeeps. Our company was founded in Ohio in 1973 and relocated to Bristol Pa in 1989. In 2006 we moved to our current location in Levittown, PA. Throughout the lifetime of the business, our team has worked on countless military Jeep restoration projects & supplied parts to customers all over the world. At our facility, we rebuild, restore, and repair all of the major components of jeeps, except engines. These we put into the hands of an experience engine rebuilder who knows all the specific details & quarks of the 4 cylinder jeep engines. We have a unique philosophy at our shop that prevails over all things that we do: offer the best parts or nothing at all. If you’re restoring your jeep, you don’t want to be putting it together with low-quality parts. If you are, you might as well not restore it at all. It lowers of your vehicles reliability, limits the resale value , and gives it a less authentic appearance. Restore Your Vintage Jeep With Us! Restoring your military jeep is one of the most fulfilling projects you can take on, and we want to help you get it done! Whether you’re looking for restoration or rebuilding services, or just Willys parts for sale online, Army Jeep Parts is the go-to source for whatever you need to revitalize your military jeep. To see a full list of our products continue browsing our site! For questions or help with ordering, call us at 866-934-1206.